Situated on the National Highway-31 on Patna-Ranchi main road, some 120 km away from Bihar capital Patna, Nawada is a place of historical and mythological significance. Half of the Nawada district’s land is surrounded by forests and hills and several important places, like Kakolat Falls, offer a panoramic and pleasant natural sight to the tourists visiting Nawada. The legend has it that Nawada was visited by Pandavas of the Mahabharata fame during their exile. Historians in their writings have acknowledged and discussed the discovery of several monuments, statues and coins of the Mauryan, Sunga, Pala and Mughal periods in different parts of the district. One can have a dekko at these finds, preserved in the Nardah Museum at Nawada town, the district HQ. Peasant leader Swami Sahajanand made this district his workplace while Loknayak Jayaprakash Narayan or JP, whose historic ‘Total Revolution’ call in 1970s led to the formation of the first non-Congress government in New Delhi, had his ‘Sarvodaya Ashram’ at Shekhodeora in the district’s Kauakol block. This Ashram, established by Loknayak Jayaprakash Narayan, is 55 km away from the district HQ and is located in the forests at Shekhodeora village. Endowed with very natural and scenic beauty, the place had been a home to JP for quite some time. Tourist inquiries about the Ashram can be made from 9934082815. Nardah Museum is one of the prominent museums of Bihar with a very rich collection of ancient artifacts adorning its shelves. Several statues and coins of the Mauryan, Sunga, Pala and Mughal eras have been preserved at this museum, opened in 1973 soon after Nawada was carved out of Gaya as a separate district. Kakolat Falls is a popular water falls of the district that attracts people from different parts of the country for picnicking in the summer. Water here falls from approximately 150 ft above the ground level into a well maintained pond at Kakolat, 33 km from the district HQ. It is surrounded by lush green forests, which add to its beauty. This is the place which, according to the legend, was visited by the great Pandavas during exile. Also, a mythological king, cursed by a saint to take the shape of a python, got salvation after bathing in the water here. Having gotrid of the curse, the king proclaimed that those who would take a bath in the waterfall would never be reborn as a snake. A large number of people from far and near make it a point to take a bath under the falls due to this belief. Tourist inquiries about Kakolat can be made from 9334610352. One of the holiest temples of Jains, this temple is located one km away from the district HQ on the National Highway-31. This temple, 12 km from Nawada town, is believed to have existed since the ‘Dwapar Age’. The legend has it that the water in the temple is sacred enough to cure leprosy patients. The Sitamarhi Cave is situated in a remote part of the district, about 30 km from the district HQ on the Gaya-Nawada main road, The cave is about 16 ft long and 11 ft wide. 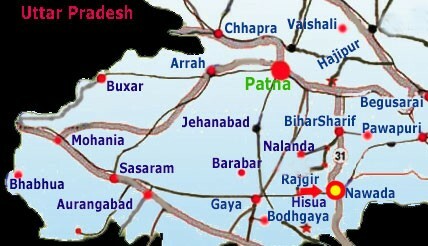 Nawada is connected with rail link, but the neighbouring Gaya Junction is better connected with all major cities. Alternatively, one can reach Patna and hire a taxi to Nawada. It is advisable to make Nawada a part of the package tour of Gaya, Nalanda and Rajgir because all these places are located in a radius of 100 km and are connected with good, motorable roads. AC and nol’1-AC rooms available for Rs 250.R5 400 per day per room. AC and non-AC rooms available for Rs 250-Rs 600 per day per room. WHERE TO EAT Dozens of restaurants, motels and dhabas are around. The food at these places is not very costly.